So i've used the product for a few days and i'm blown away. Then i decided to show it to my wife and no word of a lie just as i say to here it never falls off the phone pops off onto the floor. The heat from the vent melted the glue on the disc shaped magnet causing it to loose it's adhesion. The magnet didn't fail the glue did. Can be worked around but looses a star for that. Very small and easy to use! This is a very strong magnet, it holds even the heaviest phone. Good size magnet contact for the back of the phone. Contact holder itself slots into the airvent and is a good size. Overall a great purchase and reasonably priced. I put the magnet inside my thick rubber phone case and it adheres to the vent mount car holder really well.the mount is small and very neat, not in your face, very subtle. Love it. I’ve been sceptical about these car magnets, having read reviews about car magnets melting or snapping due to weight or if the vent is on. 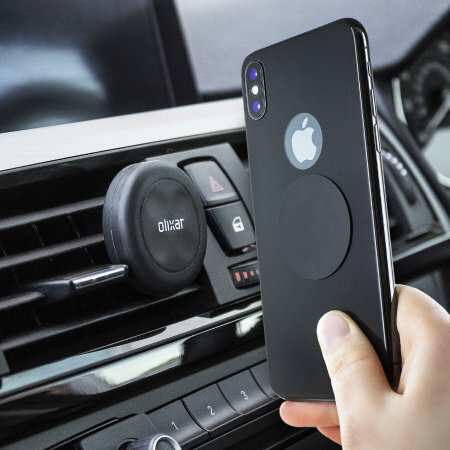 I can honestly say mobilefun.co.uk and Olixar I am very very impressed the magnet is strong enough to hold my large iPhone XS Max in any position. Completely eliminates the need for a car phone holder blocking your windscreen. Cheap, convenient and looks great, I get in my car and just tab my phone against the magnet and it holds it firmly in place. This product is strong holding the phone and not bulky in anyway. I'm very pleased with the purchase and my mum bought one too. This product is perfect for its purpose and working perfectly! The customer service is amazing! I reccommend buying from them because their assistance is available and serious. Amazing product and amazing staff! Thank you thank you thank you! Easy to install and works perfectly for holding my new iPhone XS. Good fast delivery. Product as described. Will use again. This product is fantastic. Strength is great- holds in place and does everything it's meant to do. Ok if you don’t mind your phone being heated from the vent..
As my car only has a few small air vents, I should have thought ahead before buying this gadget. With colder weather here, my heater is on in the car, also heating my phone. My phone also fell off the magnet when turning a corner. Best phone holder I’ve had! I’ve had trouble with suction & vent holders in the past. Was hoping this would be a turn around and I was right! The vent grip on the back of the mount is very tight & grips the vents well, coupled with the provided magnet strip in the back of my phone case, the hold is very very strong. I have the 7+ with a thick heavy duty work site case on & im able to have my phone veritcal or horizontal while going over bumps etc with no sign of it coming off. Best part is the quick and easy mount and dismount with it just being a place on & pull off movement. Would recommend if you’re sick of naff phone holders for your car. This works really well v strong magnet keeps the phone in place. Easily removed and repositioned. Great piece of kit. Would have been better sticking my phone to the dash with blue tack- a much cheaper and more effective option. Very happy with information, and description. No good with my cars air vents, doesnâ€™t sit correctly and falls off with my phone when driving, Ford mondeo 2017 and galaxy note 9. Nice product but unfortunately the magnets aren’t strong enough so it only worked if I took my phone case off, I’ve returned it. The product has only bern in use for a fw days but so far appears to be reliable and does exactly as described. The item was bought as a gift for family member. I found the instructions easy to read and execute. Then put it into practice and it worked! The only thing not to do is to accelerate suddenly or it might fall off. Does what's it's meant to and easy to mount in the car. Works well. Can go in any vent which is useful when visual access is limited. I kept my phone case on and attached the magnetic plate to the back of the casing. I did have my doubts about whether the phone would stay attached to the mount but so far it has been fine. good product which fits its purpose well. I am pleased with the product and have used it on a long journey where it worked really well. I would recommend it. That it would hold the weight of an i-phone. The phone fell off within 20 seconds. We put it back on and the whole thing fell off. Haven't used it since. Definitely not fit for purpose. Sorry to hear you are not happy with this car holder. Can you please contact our Customer Services team so we can look into this for you. Amazing product, simple to set up and use. Magnet attached to my phone is thin and works seamlessly through my case. Delivery speed is an issue but worth the wait on this one. Great product. Simple to install and holds the phone neatly and tightly. Quick delivery. Well worth it. Top item, very happy with performance. Top item, very happy with performance. Seems to work well with most phones. Was a little sceptical as to its holding power but pleasantly surprised and now recommending it to family and friends. Bought a samsung case too from mobile fun wouldnt hesitate to purchase again from this supplier. Would recommend this product. Magnetic hold is very strong. I got it for my s8. neat, effective and attractive with a simple design that holds strong. It's a neat design and well made. The Olixar magnet holds iphone 7 firmly and there's no fussing with adjustable grips, or oversized, clumsy designs..
Who would have thought something so inexpensive could work so well. But it does. Really simple idea but works really well. Mounted on the centre vent in my car it makes charging and using the sat nav so easy. Would highly recommend it. Even stays at reached with my cornering! used with samsung galaxy s3 with ballistic case; put the magnet on the inside of the plastic case. the mount is place in the vent of a merc at about a 60 degree angle and then pluged into the aux port. so; so fair so good with about 3 weeks use i gona try in my corse and see if it works in there with daliy use. Easy instructions and easy installation. I used it on my Samsung Note 8 and it DOESN'T interfere with wireless charging and using Samsung Pay. I no longer use this product as the magnetic strips aren't strong enough and going around corners sometimes made my phone slide off. Clips into air vent easily. Solid product with a clean silicone Cover surrounding the magnet. So happy I purchased this item. This is a great little gadget. I've previously tried several other mobile holders in the car but until this one they have not been successful - they either blocked my vision and looked ugly or were not very effective in securing my mobile resulting in it often ending up on my lap when cornering. This one is simple and does the job most effectively - so quick and easy to install. Would recommend anytime. Was sceptical about how able the magnet would be to hold the phone, but it is surprisingly powerful. I've had no problems using the device in 2 different cars and the extra magnet provided is appreciated to use with a second device. This is great tool to house your mobile while driving. Sits easily in your vents, easy access to phone and for charging. Excellent for horizontal vents but very poor for vertical vents as it easily falls. Neat and tidy unit, fits on central vent of my Toyota Auris above the audio display. Have to position carefully on magnet, as in certain positions magnet turns screen black/blank or puts into a very basic screen shot. Reverts when moved slightly on magnet. Holds phone securely. I was worried that this wouldn't work through the leather case of my iPhone but decided to give it a go anyway and hope for the best. Pleased to say I'm delighted..... not only does it work fine but I didn't even need to stick the magnet onto the phone, merely slipped it between the back and the case so no problems with disfiguring the handset. The portability of the holder is a bonus as it means I can use it in whichever car I'm driving and it's literally a 2 second job to clip it into the air vent. Great little gadget, does exactly what it claimed. I bought one of these for myself and the wife was so impressed that purchase number 2 followed shortly after. Great little gadget that in my opinion is better than the Kenu air frame that I have previously used. As per normal excellent service and product from the Mobile Fun team. What a great device.Have spent more on an inferior phone holder!! Phone out of the pocket on to the dashboard and visa versa. Thought that the magnetic field might affect the phones performance, doesn't appear too. Definitely worth investigating. Good quality product, easy to use and does what it says it does! Just what I needed to use my mobile phone for satnav and hands free use in the car. Grasps the heater/air vent well and the magnet is very strong. My Samsung S7 Edge doesn't move. If I use the additional battery case, the magnet still holds firm, but spirited driving can cause the heavier phone to move. If it had a ball joint between the clasp and the magnet, this product would be perfect. my needs. Will be purchasing another for my husband's car. Vent mount is about as easy an install as you could hope for. Just push onto vent, job done. Also easy to remove and reposition. Magnet sits neatly between your phone and case, and holds to the vent mount with enough force to ensure it does not break free. Great and unobtrusive solution for mounting your phone either in portrait or landscape. I am always on business trips and on the roads. Had the little car holder in my handbag and I can use it on any rented vehicles. It serves its purpose well and highly recommended. I have in a Ford Focus 2016. Works really well. Good looking also not those bulky vent or windshield devices. Really happy with the purchase. This works better than any other phone holder I have used. No need to take my phone out of its case, it just sticks straight on. It's not bulky, and ugly, it is pleasant to look at when not in use. It is safe as it doesn't impede my view out the windscreen like other holders do. Exactly what I was expecting and works great. I have this fitted to a Yaris which has quite small airvents but it still works fine. It's a really neat design and will be easy to take with me to use in hire cars. I have a case on the phone and so haven't needed to actually stick the magnet to the phone as the case keeps it in place. Not sure if I'd use this product if I only used a bumper case as I didn't want the black magnetic didc on display. The other advantage of not having to stick on the magnet is that I'll easily be able to transfer it to another phone. Product is great quality and the delivery was super fast, even during the festive season where mail is slower than normal. I will definitely recommend this company to friends. Works, but is slightly awkward in Ford Focus 2013 as air vents are vertical. Therefore a bit near steering wheel. But as I said it does the job. Love this! Comes with 2 magnet stickers , so can use with 2 phones. The magnet base can be moved around vents very easily. Good strong hold- phone doesn't budge when you are touching the screen. I would highly recommend this product. Received the part on time within a week. Very swift and straightforward to deal with. I have an iPhone 7 plus which is a big phone. I have tried may of these things with little or no success until I discovered this device. It is extremely simple but works very well indeed and holds my phone perfectly. The only downside is that the magnet is so strong that when I remove the phone it takes the vent mount with it. Small price to pay for a very good product. I would recommend this to anyone. I tried 2 other similar products previously which didn't work, but this one is great. The best car phone holder bar none! The magnetic holder is the very best phone holder I've had bar none. I just get into the car and tap the phone onto it and away we go. No amount of shakes or bumps will detach the phone. Highly recommended. It really is the dog's balls! This is a great wee holder very yousfull & very handy to fit . My phone dosed slide all over the car . Great little bit of kit. Strong magnet clips into the cars air vent and doesn't move around like other car phone holders. Phone simply magnetises onto the holder. And doesn't budge. Not even whilst cornering. I think it's that good I ordered another 1 for the wife's car. Very happy with my purchase. I have had a lot of phone holders, I'm in sales and spend a lot of time in my car, and this by far is the best one I've ever had! It was super easy to set-up and it holds brilliantly. It also looks clean. It simply works! Definitely recommend it. The only dissspointing thing is that I didn't find it sooner. Discreet, easy to use, very sturdy. Great product.